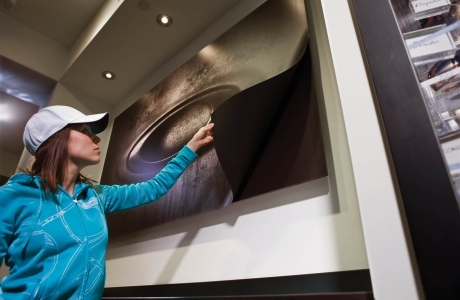 ActiveWall® Micro-Iron® latex primer may be painted on a wall or surface for the most dynamic variation of the graphic system, allowing for a complete wall graphic, in-store experience. InvisiLock® high performance magnet is custom engineered for optimized strength and adapts to almost any surface. In addition to the adhesive option, InvisiLock® is available in non-adhesive for use with ActiveWall® primer. MagnaMedia® Micro-Iron® print media deliver photo-quality graphics that lay flat, adapt to any surface and can be easily updated. MagnaMedia® works on all printing platforms, can be rolled-out by in-store personnel and lowers installation and shipping costs. Simple product installation thanks to the magnetic system. Unlike other image replacement systems, the system Visual Magnetics can be implemented by any person, without the need of the intervention of specialized technicians, and in the case of shops and stores, directly by sales staff. Great versatility thanks to the "multilayer": the product can be applied in several layers, allows then to give vent to the creativity and to have the possibility of changing very quickly (for example, for change the percentage discount in the sales period). The Visual Magnetics Graphic System is transforming the way brands roll out in-store campaigns with unrivaled versatility and stunning photo-quality results. 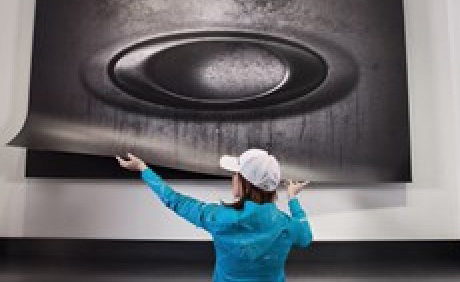 The patented magnetic-receptive media developed by Visual Magnetics provides photo-quality imagery to a graphic system that is in a category of its own. With this revolutionary system, printed graphics now arrive in inexpensive shipping tubes and can be rolled on by store personnel, eliminating recurring installation costs, high shipping fees and damaged assets. The finished results are stunning, photo-quality graphics that lay flat, adapt to any surface and can be updated effortlessly to ensure that in-store promotions are relevant all times. Upgrading to the Visual Magnetics Graphic System is nearly effortless. Retailers are able to seamlessly transition their current assets and retrofit what is already installed at their retail space. With this revolutionary system, the printed graphics now arrive at the stores into shipping tubes and the shipping cost is not expensive. Stores can avoid application and high shipping costs and prevent damages during transportation. 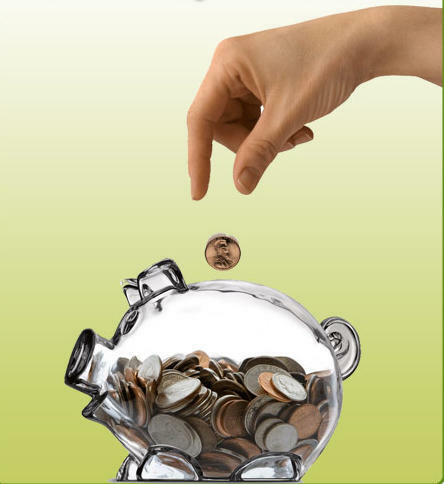 It is also easy, quick and cheap change the printed graphics. Working together with leading retailers, Visual Magnetics furthers its mission to influence the industry in reducing the carbon footprint of in-store graphics. Use of MagnaMedia can reduce the impact on landfills by 50x, compared to a 12mm foam board program equal size. MagnaMedia, POLYfive and POLYeight are made with up to 50% post-consumer plastic. All MagnaMedia products are fully recyclable. 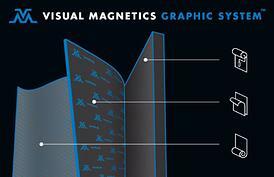 Users are encouraged to return used graphics to Visual Magnetics facilities for recycling. Magnetic-receptive coating poses no known health risk. It is constructed from a natural mineral extracted from the earth and combined with latex binder. Magnet components utilized in the Visual Magnetics Graphic System pose no known health or safety issues and will not cause interference with electronic equipment. The range of the printing product is composed by: polyester films, polypropylene films, cotton canvas, bamboo, natural jute and rubber, cellulose base and chalk board. Green oriented – A growing selection of Visual Magnetics MagnaMedia is now made from 100% post-consumer and highly renewable natural base materials. MagnaMedia creates 98% less waste than a graphic program using foam board. All MagnaMedia products are Pvc free!!! Certification – All products are Class A or ABC fire extinguisher. MagnaMedia print films include white opaque polyester and polyolefin films, cotton and other natural fiber fabrics and are by definition, exempt from the requirements for a Material Safety Data Sheet (MSDS) under the OSHA Hazard Communication Standard 29CFR1910.1200 and EPCRA regulations.